I discovered The Big Adventure Series by Little Mammoth Media last month when I received a copy of The Big Christmas Tree from Little One Books. I fell in love with the mission, vision, and implementation of the series from that one video alone. Why? Because we’re kind of documentary junkies around here. The Big Adventure Series takes the concept of documentary and explores what that means for kids. And they do it very very well. ONCE UPON A TIME… filmmaker William VanDerKloot was watching kids’ videos with his children. He was disappointed with what he saw… and what he didn’t. With a few notable exceptions, most children’s videos were poorly done and overly simplistic. Then he got an idea…. A Peabody award-winning director/producer, VanDerKloot decided to produce one himself. The first subject came to him while driving past the Atlanta airport in a car full of children. As they drove down I-75, a giant plane took off overhead. Immediately VanDerKloot was bombarded with questions from the kids, “What kind of plane is that?” How fast is it going?” “How many passengers are in it?” THE BIG PLANE TRIP the first video in The Big Adventure Series®, was born. But VanDerKloot did not want to make a simplistic video “just for kids.” THE BIG PLANE TRIP, and each subsequent video in the series, is constructed with various levels of information so that an entire family, from the youngest to the oldest, can enjoy and learn something new with every viewing. Can you see why I love this? My kids do too. You can take a peek at all of the Big Adventure Series trailers here. Go ahead and scroll through until you see the one for The BIG Submarine. I’ll wait. Did you watch it? It was just 1.5 minutes of what is really about 50 minutes of information awesomeness. So much awesomeness that I scribbled FOUR pages of notes when I watched it with my kids. Seriously. These videos are an educator’s dream come true. If there’s some way to branch off on all the various subject veins, they do. The BIG Submarine begins with a science lesson on all the water there is on the Earth. They start big with the ocean and then bring it down to something that kids have a little more tangible understanding of such as a swimming pool, a bath tub. They show a toy submarine, then a real submarine. Boating terms are introduced. Little Mammoth does a nice job of mixing actual footage with quality hand drawn illustrations to make their points. History is brought in as they explain the first attempts of putting together a submarine during the American Revolution. The military has a big part to play in this episode, for obvious reasons. Practical questions of how the sub manages to get under water and back up again are tackled. Details of the inside are shown as they describe how everything has to be secured on a sub, else it falls. Every shelf has bars to keep items in place. They show how the men sleep on a sub. They explain the services available to the men from the library to the barber to the doctor. They explain how the men are trained in simulators before they go out in the real thing. Did you know the most dangerous thing that can happen on a sub is the threat of fire? I never knew that before. I also didn’t realize the men are only allowed to hear from their families once a week in a 40-word message called a Family Gram. You’d sure learn how to communicate succienctly in those circumstances, huh? My girls were very sad for families once they realized how much time and distance separates them when a parent is deployed. 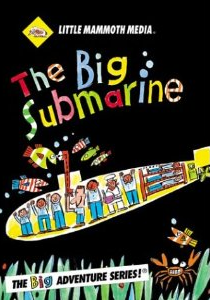 It was cool for my kids when I informed them that we actually have a very loose connection to a Submarine Officer in our family: he’s the little brother of my sister’s husband and technically I haven’t seen him since he was about 6 years old, and that was some 20 years or so ago, but it counts, right? Anyway, all that to say that once again I was blown away by the depth and detail put into the making of this video and am looking forward to watching the other two. Check your local library for these as well. The St. Louis County Library system has all of them. We loved the aquarium one when we were studying about fish. Thanks for the reminder that I was going to check out the Christmas tree one at Christmastime! I give a thumbs up to the Big Submarine, too! Thanks for the library reminder, Linda! I don’t make it to the county library very much, but I would if I’m looking for one of these! Oh man, somehow I missed that your husband was a submarine officer. Wow. Thanks for filling in the detail I left out here. Your example was hilarious. We are documentary junkies, too! Cole chose The Big Boom! (volcanoes, explosives, and sonic booms) and we downloaded and watched it. Thanks for putting us onto this source! Love it.